One mistake people often make with speed sleds is loading them with too much weight. This article explains how to use sleds effectively. The speed sled is a great tool that can help athletes improve their speed, power and overall athletic ability. If you don't have access to a speed sled, you can build your own. A Prowler-style sled can also be used, but those are typically a bit heavier. Speed sleds can provide a very effective workout. One mistake people often make with speed sleds is loading them with too much weight. You want to use a weight that results in your speed being 10% slower than it would be if you were running without resistance. So if you typically cover 20 yards in 3 seconds on a sprint, your optimal sled sprint weight would be a load that sees you cover that same distance in about 3.3 seconds. For many people, this load will be about equal to 10% of their body weight—so 15 pounds for a 150-pound athlete. With that in mind, here are four awesome speed sled drills that can help any athlete. This one is exactly what it sounds like. Run all-out for 30-40 yards while attached to the sled. Remember this is about explosive speed, so more weight isn't necessarily better. Time the athlete on a standard 30- to 40-yard sprint. While they rest, hook the athlete to the sled via the harness and add a small amount of weight. After two minutes of rest, have them run again. Once you find a weight that results in their time being about 10% slower than their unweighted sprint time, stick with it. Repeat at that weight for four total sprints, with the athlete resting for two minutes between reps.
Running up a hill can help with arm stroke and knee drive. Since you're ascending an incline instead of running on a flat plane, the limbs will have to work harder. Since these are naturally more difficult than flat-ground sprints, the weight on the sled should be lessened. Time the athlete on a standard 15- to 20-yard Hill Sprint. While they rest, hook the athlete to the sled via the harness and add a small amount of weight. After two minutes of rest, have them run again. Once you find a weight that results in their time being about 10% slower than their unweighted Hill Sprint time, stick with it. Repeat at that weight for four total sprints, with the athlete resting for two minutes between reps. You want a degree of incline that allows for a smooth running motion. If the hill's too steep, you'll see the athlete has to use a lot of small, choppy steps to ascend it. When in doubt, err on the side of less incline. Sports aren't just about running forward or backwards. Side-to-side movement is essential, too. Working on lateral movement with a sled can help the athlete improve the strength of their hips, glutes and thighs. Hook the athlete to the harness. The hook should be on the side opposite the way the athlete is traveling. You want to utilize very light weight on these. If the athlete is having a tough time staying low and moving smoothly through the drill, the weight is too heavy. The weight of the sled without additional plates may be enough resistance here, depending on the athlete's training level. Have the athlete shuffle in the opposite direction of the sled for 10 yards. Have them immediately walk around to the other side of the sled and repeat in the opposite direction. Focus on staying low and square, and avoid crossing your feet. Repeat for three reps in each direction, taking two minutes of rest after completing a shuffle in each direction. You can have a speed sled work like a jammer machine in a weight room. All you need are individual handles to connect to the rope or band of the sled. TRX handles can work well for this. This video demonstrates the exercise. It may not look like much at first glance, but it offers a unique challenge for your upper body and core. This drill is especially useful for football players, as it can mimic the actions they'll utilize when engaging/disengaging opposing players. Securely connect the handles to the sled and have the athlete hold one handle in each hand. Have them walk out while holding the handles until the rope/line is taut. The athlete should hold their hands up at shoulder level, facing away from the sled and standing in a split stance. On your go, the athlete should press the handles forward, striving to keep their elbows tight and core rigid. They should then take a step forward to re-assume the split stance (albeit with the opposite leg in front this time) and get those handles back at chest level. Continue pushing for 10 reps. Perform 3 sets of 10 reps, resting for two minutes between sets. 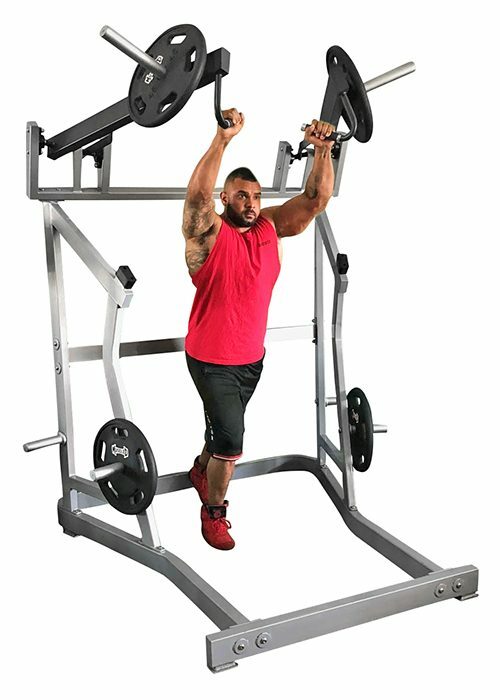 It might take you some time to find the ideal weight on these, but an inability to push the sled without collapsing their torso forward is a sign the load might be too heavy.